A machine used to increase pressure in a water or compressed-air pipe. 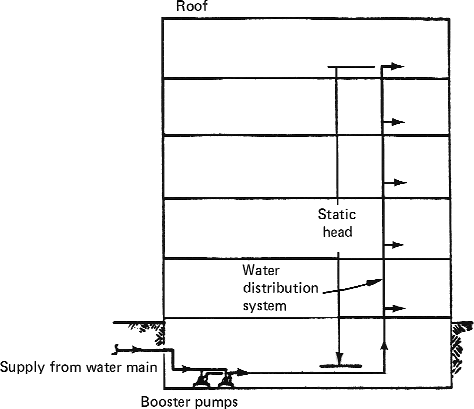 An auxiliary pump which is used in a piping system to increase or maintain the pressure in the system. Normally a pump, in the aircraft fuel system, meant to prevent vapor locks and cavitation of fuel as well as to maintain a satisfactory supply of low-pressure fuel to the engine-driven pump. This is located in the main fuel tank, to which the fuel from other tanks is transferred for supply to the engine. Also called an LP pump. Booster pumps may also be provided in the oil system, or the like, used to provide additional or auxiliary pressure when needed or to provide an initial pressure differential before entering a main pump. Normal usage is, however, in respect to aircraft fuel system. See fuel boost pump. As long as the primary dredge pump is adjusted and working correctly, and it is being operated with sufficient power, a booster pump is the best option to improve pumping efficiency. The booster pump on automatic cleaners is usually referred to as a "flooded suction" pump. The acquisition of the Middlebury system and the construction of a water main extension and booster pump station will require the approval of state regulators. The pumps enable the virtual eradication of start up "inrush" current, booster pump starts at atmospheric pressure and consistent pump rotational speed, regardless of input frequency. M 60 Meter Head ISI Marked Mono Block Booster Pump with 80 MM inlet and outlet Conection and Electrification of Booster Pump At Side ward no. com)-- Fura International, a leading manufacturer and supplier of Industrial pumps and pumping equipment recently added a superior line of booster pumps in its huge range of industrial pumping products. Nearly three- quarters of the residents use booster pumps too, which is illegal. Features include: no emissions, elimination of contaminated waste waters and oils through air cooling, lower maintenance and disposal costs, elimination of back oil migrations, a small footprint, and the ability to accommodate booster pumps directly to achieve higher speeds at lower pressures. Kinney was the first to use booster pumps to produce lower vacuum levels and higher capacities, and to design/build a three-piston rotary piston vacuum pump. Its principal products are vertical turbine line shaft and submersible pumps as well as centrifugal pumps, high pressure booster pumps and packaged pump station systems. Three tenders for the conducting the required (a) maintenance & repair of power generators at Al Obour potable water plant & related booster pumps, (b) rewinding & repair of a 500 kW electric motor for Al Fostat potable water plant, also of another 790 kW electric motor at Al Rooda water plant, and (c) maintenance & repair of electric generators at Booster pumps No.